Giant African Land Snails are hermaphrodites, meaning that one snail is both both male and female. Although they don’t often self-fertilise, it is not unheard of, so keeping a single snail will not guarantee that you won’t end up with eggs or baby snails. Achatina fulica are the easiest snails to breed and don’t require much special attention in order for them to reproduce. Snails can start breeding after around six months and the larger of the pair will normally carry the eggs. Clutches of eggs are produced in batches of anywhere between 30 and 1,000. Usually, batches are produced several months apart to give them a better chance of survival, but we recommend you check for eggs every three days. Eggs are white or yellowish and are 4-5mm in diameter. 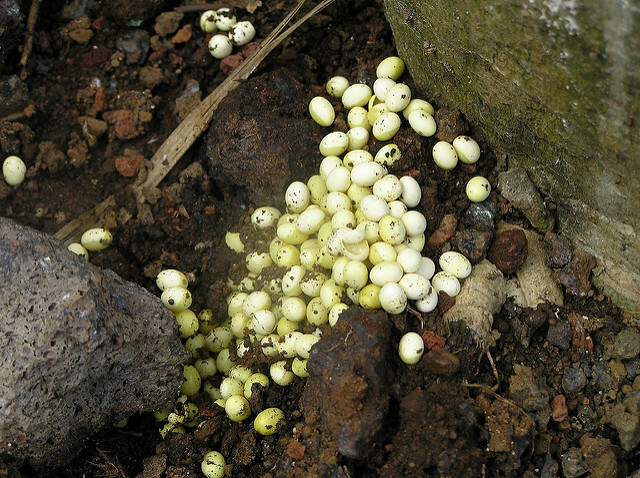 Eggs can take anywhere from several days to six weeks to hatch. If conditions are good, around 90 percent of the babies should survive. Eggs and very small babies should be kept separate from adult snails to avoid damaging them. A tupperware tub (with airholes!) with some substrate and food is perfect for keeping baby snails. However, it is important to remember that the supply of baby Giant African Land Snails is greater than the demand, making them incredibly hard to re-home or sell. If you don’t want to or can’t keep lots of baby snails, then it is best to destroy the eggs by freezing them as soon as possible. Under no circumstances should you let baby African Land Snails or their eggs loose outside, as this is illegal in many countries and will do a great deal of damage to the surrounding wildlife. Cleaning your snail tank out regularly will ensure that you find any eggs before they hatch. Unfortunately, there is an extremely large number of unwanted Giant African Land Snails within the UK and so they are often very difficult to find good homes for. If you do find yourself with unwanted snails, the classified section on this Pet Snail Forum is a good place to advertise, as well as Preloved.co.uk, which has a large number of snail postings. Facebook has many groups dedicated to snails and snail care but we are are a member and supporter of Snail World, which has an active community of snail lovers and often has space for you to offer your snail babies to other owners. Be warned: There are some people who purchase snails as live feed for reptiles, so be careful when vetting responses if you are concerned about this. If you manage to find a buyer or someone willing to adopt your snails, be sure to provide them with sufficient care information and inform them that regular checking for eggs is required. Snails can live for around ten years and grow very large, so make sure the new owner is aware of the responsibility.